Whether it’s the cute co-ed you spotted freshman year or a high school sweetheart from back home, dating in college and even after graduation can sometimes come with mileage attached. So how do you know if a two-hour drive to keep the love alive is worth it? Read up on some tips to make your long-distance love not only work, but stand the test of time--together and apart, that is. What happens when you and your beau attend the same college, but he lives the next state over? If you’re willing to keep the relationship alive once school lets out for the summer, it’s imperative to figure out how far you’ll be traveling. Although it’s simple enough to know a car and some serious gas cash are must-haves, keep in mind traffic, work schedules, and living arrangements. Summers are prime time for travel, and if you’re looking to spend long weekends together, try leaving late in the evening or early in the morning to avoid the rush. Do you and/or your long-distance lover still live with the ‘rents? Better make sure overnight guests are welcome. Finding cheap hotels half way to each other is a great way to keep the love alive without making the whole drive, and you can explore new towns together. 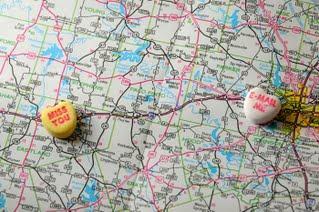 Long distance relationships automatically mean spending, whether it’s for travel or exploring each others' home town. Often, couples in long distance relationships feel the need to entertain every time their significant other is in town, and who can blame them? When seeing your boyfriend for only two days at a time, it’s natural to want to find fun things to do. But it adds up. Try finding deals on Groupon or Living Social for your date nights. As the relationship progresses, it’s natural to find you need your weekends to catch up on errands and life in general. Luckily, long-distance love is can be made that much more intimate when your beau accompanies you to the grocery store, and you tag along to Target with him for some undershirts. Long story short, don’t put your life on hold because your boy’s in town; having him with you can make the littlest errands seem fun. The key to making a long distance relationship last is trust. Not seeing your significant other for weeks on end can harbor feelings of loneliness, and if one or neither of you have ever been in a long distance relationship, temptations can be hard. But if you’re open and honest about tonight’s festivities and your man is the same, the miles between you shouldn’t matter.